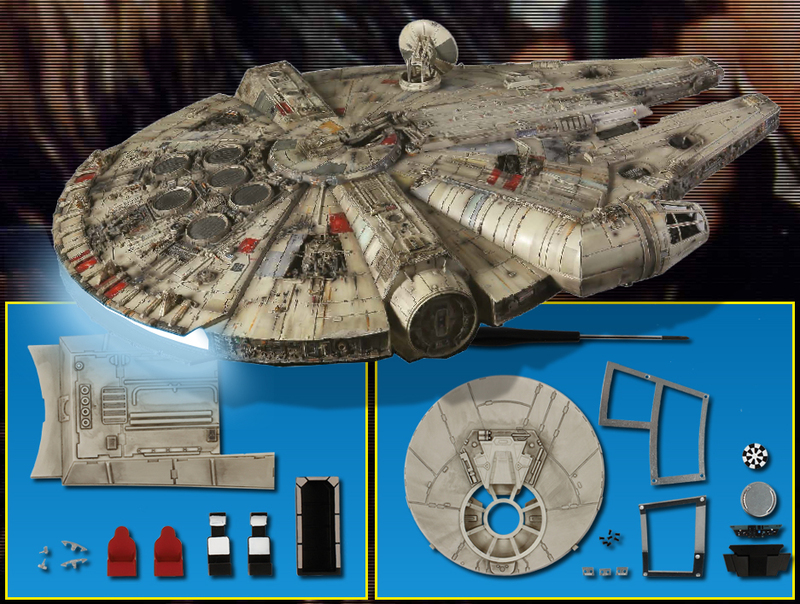 “Build the Millennium Falcon” partwork by DeAgostini. This is quite exciting for me. 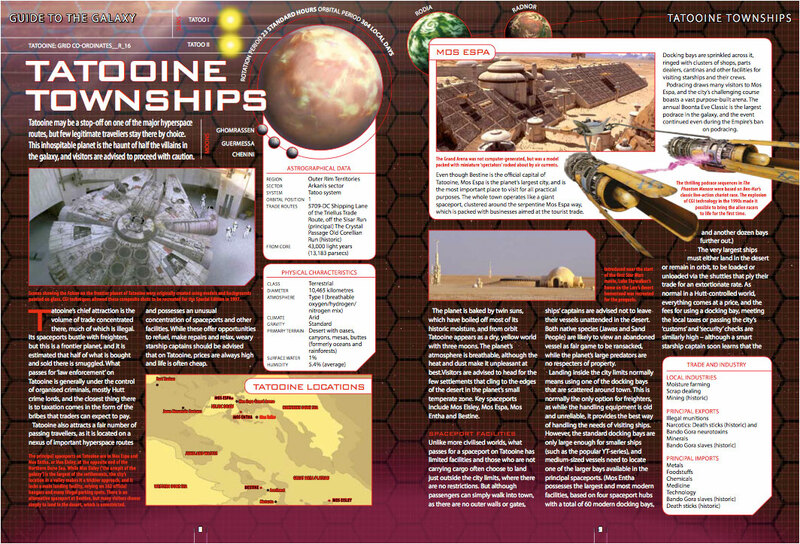 DeAgostini have released a new 1oo issue Star Wars part work called “Build The Millennium Falcon“. The model itself will be 31” long and lit. 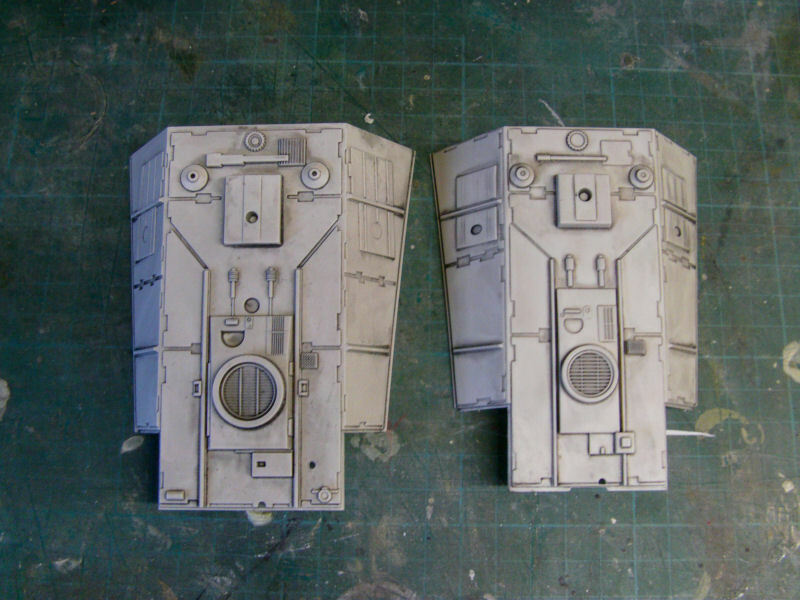 What’s exciting for me is that the model also includes interior parts such as the engines, cargo bay etc. Once built you can display from a wall stand, which I think is pretty neat. I can’t comment on how the finished model will look, but it’ll take some doing to beat the Finemolds and Master Replica versions. The Magazine itself promises to be Millennium Falcon centric so I’m hoping to see new artwork and Expanded Universe references. I wonder if Chris Trevas is involved with this project? 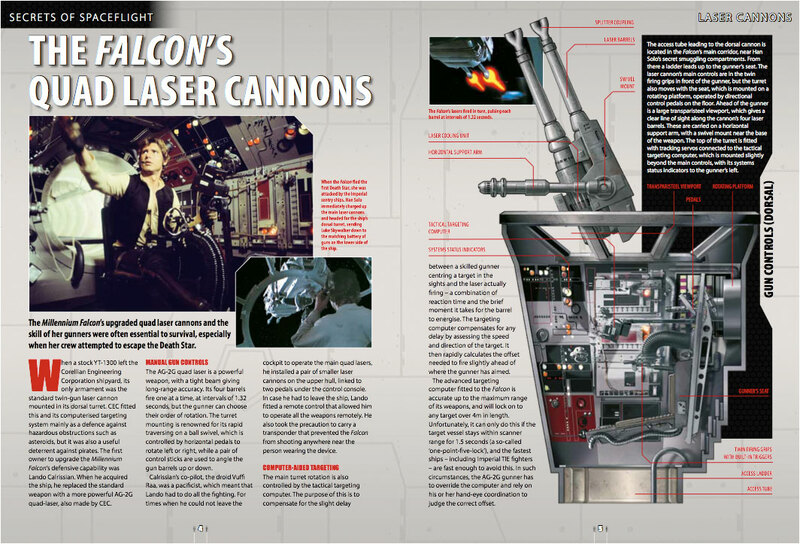 No doubt other aspects of the Star Wars will feature, but from what I see on their web sites, it’s all related to the Falcon herself. The first part is £2.99 and each subsequent issue will be £8.99 so I’m going to have to spend an impressive £893 to finish the set. I’m not even a modeller, so i’ll have to get someone else to put it together for me. 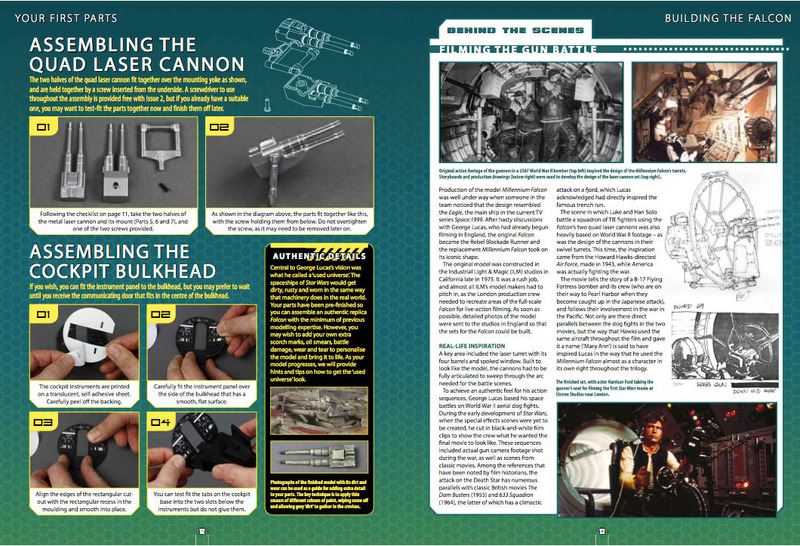 🙂 There is a section in each magazine that shows how to assemble the pieces. Naturally, I have subscribed so I shall report further. Thanks to Dunk at the Rebelscum forums for the heads up. The newer part is the one on the left. Interesting to see that they are different sizes. Rather annoyingly, the Daily Mail here in the UK have published this article about how parents are outraged at the prospect of paying £900 for a “toy”. I’m pretty annoyed with this as they’ve clearly assumed that because it’s Star Wars, it’s a toy. The MR Falcon’s are more or less settled into their final owners and anyone who wants one now has to pay an inflated price. This is an excellent oportunity for those that don’t have one to build their own high end model relatively cheaply. Besides, imagine how much fun fathers and sons can have building this together. I shall post on the partwork as i receive the issues. This entry was posted in DeAgostini Build The Millennium Falcon and tagged Build The Millennium Falcon, DeAgostini, Millenium Falcon, Millennium Falcon, Star Wars. Bookmark the permalink. 16 Responses to “Build the Millennium Falcon” partwork by DeAgostini. Holy cow, this is so awesome but I won’t subscribe for that. I’d buy it if it wouldn’t be so split up. I have collected the Fact File in the past and I know how much dough you can spend on never ending collections. I agree. I have been tied into a couple of the DeAgostini part works in the past and it does take up a bit of money. This though. This is wonderful and I think that it’ll give a lot of people to make something close to the MR Falcon for a reasonable price. Please note, this is just a 5 issue regional test at the moment. If it’s successful, it will launch properly later in the year / early next year. I didn’t know that. Well, fingers crossed that it’s a success. Thanks for the heads up. The official word I got from DeAgostini was that the subscription was “suspended by the publisher” (not them) and they have no idea if the suspension is permanent. They gave me the details of the freepost address where to send back the magazine’s cover pages for a full refund. You need to contact customer service to get a reference number for your refund. VERY DISAPPOINTED! I have had no reply to enquires as to why the subscription website is still fully up. I am gutted that this part work has been suspended but I have no intention of handing my magazines back for a refund. Hopefully the release of episode VII will drum up some serious interest in Star Wars at the end of next year. 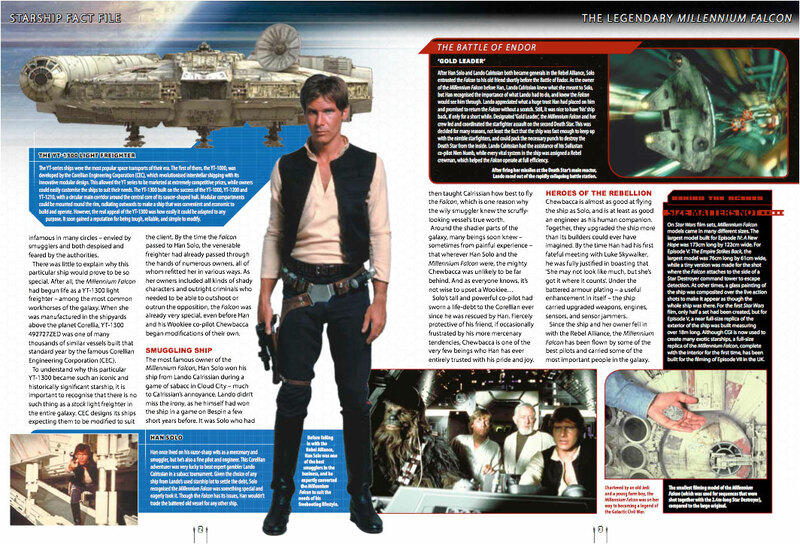 The Millennium Falcon has been confirmed to appear so I will keep my fingers crossed and hope that there is a fair chance of this project being re-released then. The have just re-released this series in the UK. I saw issue one in WH Smith today. I may yet get to complete it, however DeAgostini were not very helpful about it previously. They got me to return the cover pages of each magazine “for a refund”, then claimed they never arrived, leaving me with no refund and 4 issues with no covers!!! Really angry with their customer service. It could be JJ Abrhams/Disney blocking it over licensing issues and/or a tie in with the new movie. However the subscription site is STILL LIVE and accepting new subscriptions this is extremely mis-leading and virtually fraudulent still accepting subscriptions for a series that has ‘allegedly’ been suspended,. I will contact them Wednesday for myself and if this is the case I will be a little bit more than VERY DISAPPOINTED I will be taking it up with Trading standards and the fraud office. The rest release was considered a success, so this will be going on national sale on Jan 1st. Expect to see TV advertising start on New Year’s Eve. 1st issue will be £2.99 and the regular price will be £8.99. There will be 100 issues in all. I’ve always been a collector so this isn’t something that I haven’t done before. Two years of collecting and acquiring followed by the joy and frustration of making the model isn’t so bad. Besides, I spent £2400 on my Master Replicas Falcon. This one could be a bargain to this that still want one. Thanks for the reply – you must have more money than sense ! There are a few of us out there.